Home » » A DAY AFTER GRADUATING FROM BIBLE COLLEGE, 88-YEAR-OLD NIGERIAN MAN DIES AFTER HE CALLED TO CHECK UP ON HIS CHILDREN. A DAY AFTER GRADUATING FROM BIBLE COLLEGE, 88-YEAR-OLD NIGERIAN MAN DIES AFTER HE CALLED TO CHECK UP ON HIS CHILDREN. 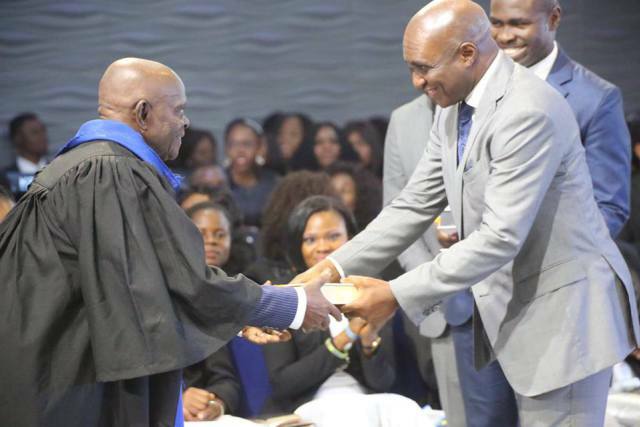 An 88 year old man has passed away a day after graduating from Salvation Ministries Bible school in Rivers state. It was revealed that the old man apparently knew he was to die as he decided to call his children and check up on them before he finally gave up the ghost. Report has it that the man will be buried on Saturday, the 12th of May, 2018 at Kalio Ama in Okrika, Rivers state at the exact spot he chose by himself. It’s not every day you find a man prepare himself for the glorious life hereafter. A day after these photos were taken on the day of his graduation from Bible School, he checked out quietly without hassling anyone at age 88. How could we have known it was the last we would be hearing from him? He’d be laid to rest on Saturday, the 12th of May, 2018 at Kalio Ama in Okrika, at the exact spot he chose by himself. You think this is made up right? Well, you’d hear from others too. Good bye Daddy, GrandPa, Great GrandPa. The entire Obed-Kalio Clan of Kalio Ama appreciates your condolences expressed in many ways than one. Thanks so much.